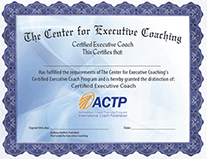 The Certified Coach Training and Practice Development Program is specifically designed for business leaders and professionals who want to become a Certified Executive Coach. This course teaches you new approaches and solutions for a wide range of clients. NOTE: The learning in this program is highly interactive and involves such activities as role-playing and other proactive endeavors. Participants should be self-starters who are comfortable with self-directed learning. Full engagement and involvement are required to obtain maximum benefit and certification. You must participate in at least 20 tele-calls which are held weekly. In addition, you will participate in 6 monthly sessions with David in person, by phone, or via Skype. You must complete 6 recorded coaching sessions that you send to David and/or Andrew for formal review and feedback. Cost: $7,500, and you can pay in ten convenient monthly installments (or save $100 by paying up front). Covers all aspects of the curriculum. These sessions occur a few times per year and are held in either Boston, MA or Sarasota, FL. You also are welcome to participate in the weekly calls. You also receive the benefits of the entire distance learning program, including up to 6 individual sessions with David in person, by phone, or via Skype. Cost: $8,500 and you can pay in ten convenient monthly installments (or save $100 by paying up front).